Southern Steel was founded in 1897 with a consistent philosophy of uncompromising quality and outstanding service. With new innovations in product design and application, Southern Steel has patented technology that is used in justice facilities all over the world. From remarkable beginnings as a metal fabricator and sliding door manufacturer over 100 years ago, Southern Steel products have a reputation and experience level "Forged in Steel." The concept of quality has always been a central theme for Folger Adam products since William J. Adam founded Adam Steel and Wire Works in Joliet, Illinois. Folger Adam entered the business in 1905, and established a company focused on the production of high-security equipment. Today, Folger Adam products have the technology to secure any size facility. Architects and professional hardware consultants internationally specify Folger Adam locks, hardware and sliding door locking devices for detention applications. 1897 Southern Steel Company is founded by David F. Youngblood in San Antonio, Texas. Metal fabrication includes jails, vaults, bridges and sliding door locking systems. 1905 Folger Adam enters the business following his father’s retirement and creates the Folger Adam Company, located in Joliet, Illinois, and focusing on the production of security equipment, including jail cells. 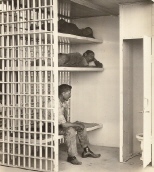 1929 Southern Steel introduces the 2700 mechanical continual motion locking system and is awarded a $1 million construction project at Rikers Island Penitentiary, New York – the largest steel-constructed jail in the country. 1945 World War II – Southern Steel actively supports the troops by manufacturing tanks for dispensing hot water to Army training camps, and submarine mine cases. 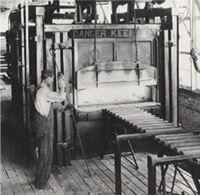 Folger Adam Company produces shell casings for the Joliet Army Ammunition Plant. 1955 Southern Steel launches the 7100 series, which leads to design of key locks that open and close by remote control. 1974 Southern Steel develops a lock and hardware division. 1983 Following a devastating flood, Folger Adam Company moves operations to Lemont, Illinois. 1986 Folger Adam acquires Stewart-Decatur Security Systems, Inc.
1988 Southern Steel purchases Republic Security Products and introduces a pneumatic line of technology. 1989 Southern Steel Company becomes a Division of Phelps-Tointon, Inc. Greeley, Colorado; Folger Adam introduces the Maxi-Mogul® Key Cylinder. 1994 Southern Steel Electronics Division is launched. 1995 Southern Steel engineers the 10500 Institutional Mortise Lock, featuring lever handle to meet ADA requirements. 2004 Southern Steel’s parent company, Phelps-Tointon, Inc., acquires Folger Adam Security, Inc. and the companies merge to form Southern Folger Detention Equipment Company, with production of both lines in San Antonio, Texas. 2005 Southern Folger introduces the Certified Detention Equipment Contractor Program and launches a Stocking Distributor Network.